Are you looking for a great starter pool for you and your family? Here at Sunny’s Pools & More, we have the perfect product for you at a perfect price. For a limited time only, Quik Swim Pools, by Splash-A-Round Pools, are included in a package deal! We want to make buying a pool as easy as possible for you. So, with your Quik pool purchase, we will include a Hayward Water Filter, pool ladder, and water skimmer. Furthermore, we provide you with the best prices imaginable. 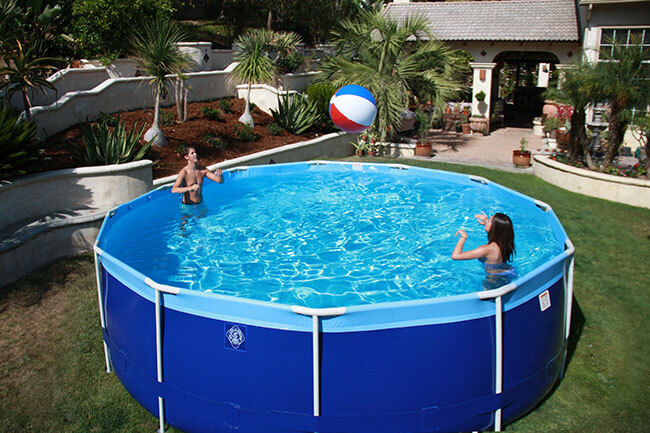 The Quik Swim 16 ft round and 48-inch tall round swimming pool with a Hayward filter, pool ladder, and skimmer is only $499.00. The Quik Swim 10 ft by 18 ft wide and 48-inch tall rectangular swimming pool with a Hayward filter, ladder, and pool skimmer is only $599.00. Why is the Quik Swim Pool good as a Starter Pool? 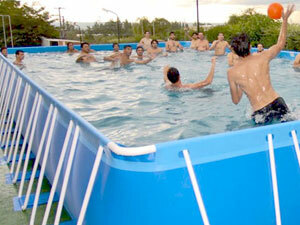 There are many benefits to owning a Quik Swim Pool. The little effort required makes the Quik Swim Pool the best for anyone’s first pool. You will not have to worry about its upkeep with daily chemicals and maintenance because the over-sized pumps and filters create amazing water circulation that requires less work. In addition, the frame requires no tools as it can be snapped together with minimal effort in less than an hour. The frame has a heavy-duty 2″ top rail and a gray-baked enamel coated galvanized steel framework. This means that the frame is sturdy but also easily maneuverable and easy to construct or take apart for later use. The liner is made of a strong 35 mil. reinforced poly-fabric 3-ply material. You will not have any tears or holes! Also, if you face any issues, there is a 10-year limited warranty on the Quik Swim Pool’s frame and liner. So, come on into our Flat Rock store today to view our demonstrations of both pools. This pool is definitely the best to start off with and to stay cool for the rest of the summer. If you have any questions about the Quik Swim Pools, feel free to contact any of our other locations.